We propose a framework for timing attacks, based on (a variant of) the applied-pi calculus. 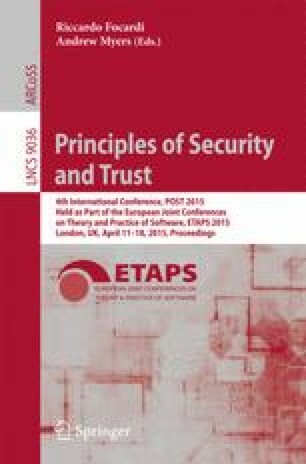 Since many privacy properties, as well as strong secrecy and game-based security properties, are stated as process equivalences, we focus on (time) trace equivalence. We show that actually, considering timing attacks does not add any complexity: time trace equivalence can be reduced to length trace equivalence, where the attacker no longer has access to execution times but can still compare the length of messages. We therefore deduce from a previous decidability result for length equivalence that time trace equivalence is decidable for bounded processes and the standard cryptographic primitives. As an application, we study several protocols that aim for privacy. In particular, we (automatically) detect an existing timing attack against the biometric passport and new timing attacks against the Private Authentication protocol. The research leading to these results has received funding from the European Research Council under the European Union’s Seventh Framework Programme (FP7/2007-2013) / ERC grant agreement n° 258865, project ProSecure.